Air Niugini Boeing 737-800 was attempting to land at Weno airport on Friday morning but fell short of runway and splashed in Chuuk lagoon. Wellington: A male passenger's body has been found inside an airliner that ditched and sank in a lagoon last week after missing the runway on a remote Pacific island, officials said. 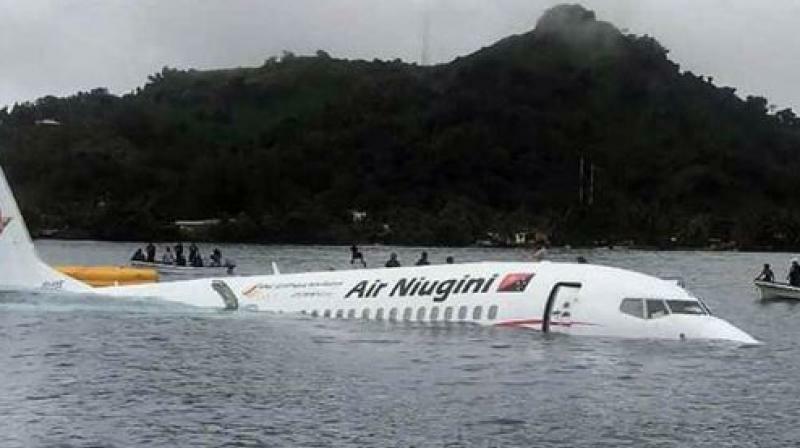 The Air Niugini Boeing 737-800 was attempting to land at Weno airport in Micronesia on Friday morning but fell short of the runway and splashed down in Chuuk lagoon. The airline initially said all 35 passengers and 12 crew aboard evacuated safely. But divers examining the submerged wreck had made a grim discovery. "It is with great sadness I confirm that the body of a male passenger was discovered by divers today as they conducted a further search of P2-PXE and the surrounding area in Chuuk lagoon," Air Niugini chief executive Tahawar Durrani said in a statement late Monday. The Micronesian government said US Navy divers recovered the body from the aircraft. Further details about the deceased were not available. The government said nine people were injured in the crash, four of them critically. It said an investigation team from the Federated States of Micronesia was working with officials from Papua New Guinea and the United States to determine the cause of the crash. "Plans are underway to recover the black box from the submerged airplane," it said in a statement. Air Niugini said Friday it had been informed that "the weather was very poor with heavy rain and reduced visibility at the time of incident".